In this study, 210Po radioactivity in tobacco and effective dose estimation from smoke inhalation were investigated. 14 most frequently used cigarette brands in Turkey were used for this purpose. 210Po average radioactivity in tobacco was found to be 25.4 ± 2.0 Bq/kg. 210Po mean annual effective dose was found to be 181.8 µSv/y. 1. Demir, B.; Okutan, M. Radyoaktif sigara: Tütün+Polonyum-210+Kurşun-210. Türk Onkoloji Dergisi 2014; 29 (1), 27-31. 2. IAEA-International Atomic Energy Agency. Quantification of Radionuclide Transfer in Terrestrial and Freshwater Environ-ments for Radiological Assessments. 2009;IAEA-TEC-DOC 1616, Vienna. 3. IAEA-International Atomic Energy Agency. Naturally occur-ring radioactive materials (NORM IV), 2005;IAEA-TECDOC-1472, Vienna. 4. Ahmad, F. Impact of fertilizers on background radioactivity level in two newly developed desert areas. Radiation Effects & Defects in Solids. 2007;162, 1,31–42. 5. Mandic, L. J.; Ðolic, M.; Markovic D.; Todorovic, D; Onjia, A.; Dragovic,S. Natural Radionuclides In Cigarette Tobacco From Serbian Market and Effective Dose Estimate From Smoke Inha-lation. Radiation Protection Dosimetry. 2016; Vol. 168 (1), 111–115,2016. 6. World Health Organization (WHO). Tobacco free initiative. In Workshop on Advancing Knowledge on Regulating Tobacco Product, 2000;WHO. 8. IAEA- International Atomic Energy Agency, Guide Quantif-ying Uncertainty in Nuclear Analytical Measurements, 2004;IAEA-TECDOC-1401, Vienna, 103-126. 9. Dogru, M.; Kumral, H. M.; Kulahci, F.; Canbazoglu, C. ; Baykara. O. Determination of low level 210Pb activity in tobac-co by using 61 keV beta-energy line. Journal of Radioanalyti-cal and Nuclear Chemistry. 2001; 249 (3), 663–664. 10. 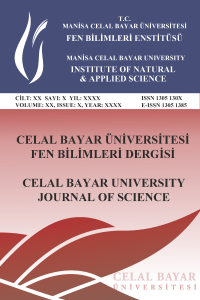 Yaprak, G.; Uysal B. Determination of low level 210Pb in tobac-co. Journal of Radioanalytical and Nuclear Chemistry.1998; 229 (1-2), 153 155. 11. Godoy, J. M.;Gouevea, M. D. R.; Azeredo, A. M. G. 226Ra/210Po/210Pb equilibrium in tobacco leaves. Radiation Pro-tection Dosimetry. 1992; 45, 299–300. 12. ICRP. Compendium of Dose Coefficients based on ICRP Publi-cation 60. 2012. ICRP Publication 119 Annals of ICRP, 41(Suppl.). 13. Iwaoka, K.; Yonehara, H. Natural radioactive nuclides in ciga-rettes and dose estimation for smokers, Journal of Radioanaly-tical Nuclear Chemistry. 2012; 293:973–977. 14. Karaöz, M.; Albeni, M.; Büyüktatlı F. Yasal Düzenlemelerin Sigara Tüketimi Üzerindeki Etkileri, Alanya İşletme Fakültesi Dergisi. 2010; 2/2, 19-36. 15. Khater, A. E. M. Polonium-210 budget in cigarettes. Journal of Environmental Radioactivity. 2004; 71, 33–41. 16. Skwarzec, B.; Ulatowski, J.; Struminska, D.I. ; Boryło A. Inhala-tion of 210Po and 210Pb from cigarette smoking in Poland. Jo-urnal of Environmental Radioactivity. 2001; 57, 221–230. 17. Peres, A.C.; Hiromoto, G. Evaluation of 210Pb and 210Po in cigarette tobacco produced in Brazil. Journal of Environmental Radioactivity. 2002; 62, 115–119.